The artistry some people posses never ceases to amaze me. Take Lisa Pelo and her glass artist friends...when you can take molten glass and shape, bend and twist it into something that leaves people in awe, that truly equates to talent in my book. On June 17-18, Pelo will for a fourth straight year invite you into her backyard studio in Clayton and into the minds of some of the best glass artists in the Midwest during Glass Artists in Action. Adam Goldberg and Mike Stevens from Gathered Glassblowing Studio in Toledo, Ohio, will headline the event demonstrating their amazing glass-blowing collaboration from 6-9 p.m., June 17. This duo makes up two-thirds of the ownership of the downtown Toledo studio that showcases a little bit of everything from functional drinking glasses to wine goblets and various abstract pieces. Add in other top artists such as Pelo, Ann Tudor, Dean Wilkerson and more, and this is a two-day, must-see summer event. I have personally attended Glass Artists in Action and can speak to the jaw-dropping precision that these masters of glass showcase every year. What makes this event so special year after year is the access to the artists and their work and getting to see all the various techniques and combinations of this art form such as glass blowing, furnace work, flat glass, flameworking and more. 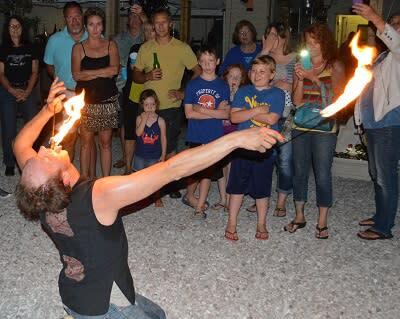 The event will include both demonstrations and hands-on experiences for guests, and back by popular demand, glass artist Chad Balster returns for a fire-dancing performance at dusk on Friday night that my family always looks forward to. The first day of the event will include demonstrations and experiences, in which visitors can make simple paperweights for a small fee, from 11 a.m. to 5:30 p.m. Following a brief break, the action resumes at 6 p.m. with the headline artists from Gathered Glassblowing Studio demonstrating their talents until 9 p.m., leading up to the fire-dance performance. The second day of the event, June 18, will include more demonstrations and experiences from various artists all day from 11 a.m. to 6 p.m. The artists will also have finished works available to the public for purchase throughout the weekend. For more information including a schedule of activities and a list of the artists who will participate, click here.